Using the SafeThink™ strategy helps workers reduce illness and injury. Participants spend about 80% of workshop time learning the strategy and customizing it to their jobs and work environment(s). Participants use their own relevant work experience and job requirements to internalize the strategy so that they can use it “on the fly”—on and off the job. As participants progress through the course, they learn the structured critical thinking strategy to identify, predict, and control hazardous situations. The goal is for participants to learn the strategy and apply it on and off the job—that’s why SafeThink™ training is competency-based. Participants must write a final test to demonstrate they have learned all the questions listed on the SafeThink™ job aid. 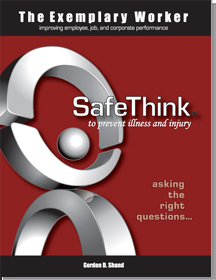 Participants require between 16 to 20 hours to complete the SafeThink™ course (each workshop takes about 2 hours). Because the course is modular, the workshop schedule is flexible. Ideally, participants would learn one part per week. This schedule gives participants time to practice applying what they have learned to their jobs and workplaces, receive feedback and encouragement, and then progress to the next part. Another scheduling option is to complete 2 parts at a time (i.e., one 4-hour session one or two weeks apart). The goal is for everyone to internalize the critical thinking strategy so that it becomes part of how they think about work, how they plan work, do work, and follow up on work. Workers who use SafeThink™ are safer and more productive.